Donations? Where did it go and what did you do with it? In 2014, the library received $450,000 in donation monies from local residents and other generous donors across the country. The Board immediately made a plan to make sure every penny was accounted for and used in ways that would most efficiently improve the library’s long-term ability to be welcoming and responsive to patron needs. The library made improvements to the building that were a decade overdue, including installing new carpet; renovating the bathrooms; purchasing new library tables, chairs, and comfortable seating; replacing 20 year old HVAC units; and upgrading sections of library shelving. Additionally, the library was able to replace and expand its aging computers, add a laptop lab, and add a SMARTboard to the auditorium space. This allowed the library to meet patrons’ growing needs for Internet access and training spaces. Beyond improvements to the physical space, the library utilized donation funds to hire a full-time programming and children’s librarian, radically improving the quality and responsiveness of our programming. When we find a need, we meet it. We create partnerships to maximize our impact and sustainability of programs. Why can’t you get more donations? We do fundraising every year and seek out grants, but it is not a steady revenue source. The 2014 donations cannot be duplicated. Donations should be used to add capacity and to work on special projects. Libraries run on stable levy funding. Core services will come and go if we rely on donations to operate. When was the last time the library asked for new taxes? The last library levy was set by voters on the ballot in 1995, over 20 years ago. If the levy fails, will the library close? No, the library will not close, but it will be forced to seek out ways to reduce operating costs. This means reducing staff, cutting operating hours, providing less programming, limiting the amount of books, movies, and other library materials the library purchases, and more. All patrons, like those who depend on the library for help in finding a job, completing homework, discovering their next favorite book, or learning a new skill, will be negatively impacted. The effect on the community of Ferguson as a whole will be significant. Who does the library partner with? Lots of people! We work with local community organizations, like the Gateway Region YMCA, companies like Boeing, and other civic institutions like the Ferguson-Florissant School District to provide programs and support for our community. Through these partnerships, we have been able to provide coding and other STEM/STEAM programs for youth, computer classes for adults wishing to learn new skills, and literacy support for early learners. We have worked with the University of Missouri Extension office to teach seniors how to live independently for longer, supported the Ferguson-Florissant Parents as Teachers program by hosting storytimes and parent workshops, and worked with local political organizations to teach the community how to run for local office. 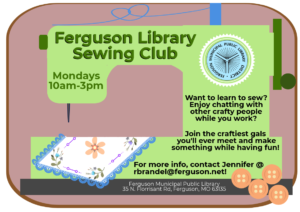 We travel to daycares in the area for storytime, participate in community events like the Ferguson Farmers Market, and visit the Ferguson Senior Center to deliver library materials to seniors who cannot come to the library. We provide free after school tutoring with the help of students from McCluer South-Berkeley High School, Parkway School District, and Washington University. We also recognize the role of the library as a community gathering space, and offer our two meeting rooms, as well as projectors, internet access, and other technology to nonprofit groups to use to continue their work, for no charge. How does Ferguson Library relate to the St. Louis County Library? The Ferguson Library is not part of the St. Louis County Library (SLCL) system. Established as a municipal library in 1930, Ferguson residents voted in 1965 during SLCL’s formation to keep their hometown public library as an independent community library, responsive to their needs. Residents enjoyed the library’s excellent level of personalized service and wanted to maintain local control of the library. Is the Ferguson Library part of the City of Ferguson? No, the Ferguson Library is not a department of the City of Ferguson. In 1965 the Ferguson City Council ruled that the library, as a special district, was not a department of the City of Ferguson. In April 1966, the people of Ferguson voted to abolish provisions in the city charter that referred to the Ferguson Library. The library has been an independent community organization and independently funded since this vote. As an independent taxing district serving the citizens of Ferguson, the library’s only connection with the City of Ferguson is that the Mayor appoints new members to the library’s Board of Trustees.The library does, however, enjoy a cooperative relationship with the City of Ferguson, including contracting for things like maintenance work and snow removal. Who makes sure the library is serving the people of Ferguson? Our 9-member Board of Trustees is an all-volunteer, governing Board, and is responsible for the financial health and direction of the library. They control the budget, hire the Director, make sure the Library is headed in the right direction, and always put the needs of our patrons and community first. How much of my taxes currently go to the library? If this passes, how much more will I pay in taxes? Current maximum rate is .22 per $100 assessed valuation (actual rate is a little bit less). The resolution would increase the maximum by an additional .18 per $100 assessed valuation. For a $50,000 home, the increase would be just over $17. How does the library’s current tax rate compare to other libraries in St. Louis County? Our thanks to the Ferguson City Council for asking this question. The chart is below. Keep in mind that the proposal talks about increasing the maximum cap, which is the most an entity can ask for in specfic circumstances, but we are not at maximum cap and most of the other libraries are not, either. For example, the max cap for the library’s residential property tax rate is 0.2200, but the actual residential rate is 0.215. If the measure passes, the library’s residential rate would not be 0.4000, but rather 0.3950. Also, Agricultural property taxes would remain at zero, since the library has voluntarily set the agricultural property tax at zero for as long as anyone can remember. The actual rate does not show how our funding compares to other libraries, only how the tax rate compares. It is only one piece in a larger picture of how to compare library resources. So how does the current funding for Ferguson Municipal Public Library REALLY compare to funding for other St. Louis County libraries? Thanks again to the Ferguson City Council for this question. 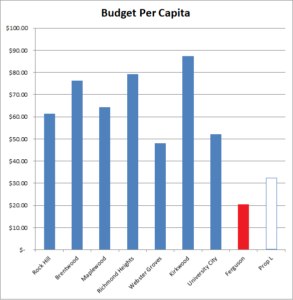 Per capita funding refers to how much money the library has to spend per Ferguson resident. It considers property values as well as tax rates, adds in other revenues (fines, fees), and divides that by population. Roughly, it is yearly budget divided by population. These numbers are from a poll of the various library directors we conducted in early 2016. It does NOT include any donations related to the unique situation in 2014 because that would be misleading if you want to know how we compare in a normal year, and how we will compare if the measure does not pass. Ferguson Library is in red, at around $20 per resident. A projected comparison for where we would be if Prop L were to pass is in the blue outlined box, at around $32 per resident.